What is a Certified Financial Analyst? CFI’s Financial Modeling & Valuation Analyst (FMVA)® program is your path to becoming a certified financial analyst. 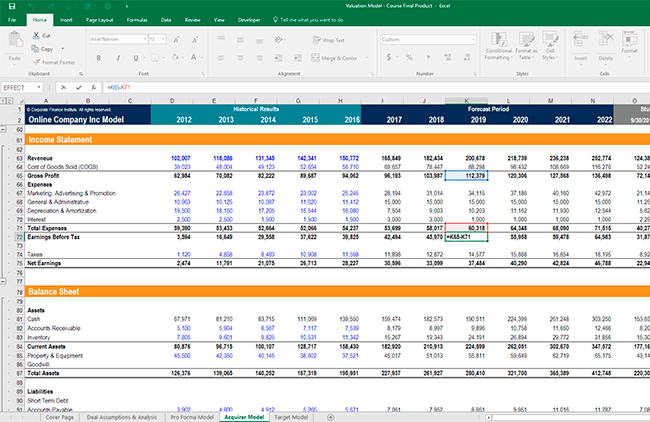 With 12 required courses on topics ranging from accounting and finance fundamentals to financial modelingWhat is Financial ModelingFinancial modeling is performed in Excel to forecast a company's financial performance. Overview of what is financial modeling, how & why to build a model. A 3 statement model links income statement, balance sheet, and cash flow statement. More advanced types of financial models are built for valuation, plannnig, and, valuation, and advanced Excel skills, the CFI financial analyst certification will help you stand out in a crowded job market. Why become a certified financial analyst? There are more reasons than ever to become a certified financial analyst. Not only is the job market becoming more competitive, but the skills required, methods of learning, and access to information are all evolving rapidly. These are just a few of the most common reasons why someone would enroll in CFI’s Financial Modeling & Valuation Analyst certification program. Everyone has their own reasons, but the most common theme is a desire to stand out with employers in a competitive job market. If you’ve already decided you want to become a certified financial analyst in CFI’s program, then the first step is to enroll online. Once registered, it’s recommended that you develop a study plan or calendar to organize your time and make sure you meet all the requirements. Each course will automatically issue you a certificate of completion upon passing the final assessment. Once completion certificates are issued for all required courses, the official accreditation of Financial Modeling and Valuation Analyst will be issued. The focus of CFI’s program is on practical applications of finance and accounting. This mostly involves using Excel to organize, analyze, and interpret financial data, using case studies of both real and fictitious companies. While we’ve made the case above for all the reasons you may wish to become a certified financial analyst, there are many reasons why an alternative option might be better for you. CFI’s missionMission & ValuesCFI's mission is to help anyone become a world-class financial analyst. Learn more about Corporate Finance Institute's mission, vision, values and culture is to help anyone advance their career, and, depending on the situation, these alternatives may be more suitable. MBA – A Master of Business Administration (MBAIs an MBA worth it?If you're thinking of going to business school you may be asking, is an MBA worth it?. The answer (as in every MBA class) is: "it depends". Other than the workload of doing an MBA, there is almost no reason not to do an MBA if your boss is paying for it. They may use it as leverage against you and lock you in, but the ROI is incredible if it's free (obviously).) can be a great alternative (or supplement) to an analyst certification. The reasons to do an MBA are that it has a broad curriculum, includes lots of networking, and is suitable for major career changes, people who aren’t sure what they want to do, and those who prefer to be generalists. Check out global MBA rankings to learn more. Work Experience – An alternative to an analyst certification and an MBA is to keep on working in a position where you are experiencing lots of growth and development. If you are fortunate enough to find yourself in this situation, it may make sense to focus 100% of your effort on performance at work. Everyone’s situation is unique, and you’ll have to decide if an analyst,or other,d certification is right for you.